Old Hollywood Films Tumblr page recently reached a milestone of 20,000 followers. The good folks over there love GIFs, so I thought I would celebrate by creating a GIF/article series featuring some of old Hollywood's most memorable moments. 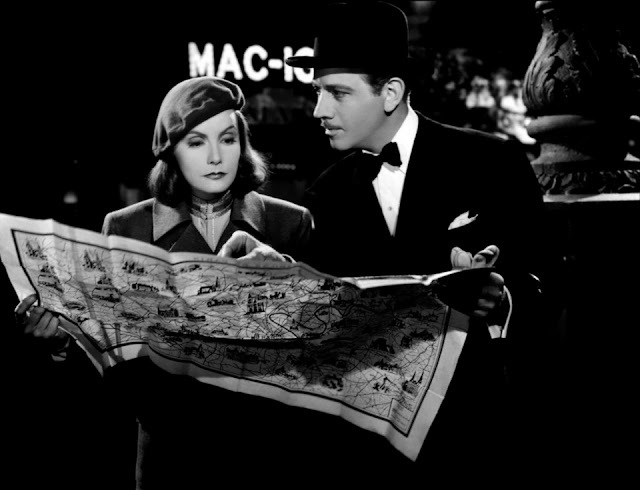 First up is an iconic moment in the 1939 film Ninotchka starring Greta Garbo and Melvyn Douglas (pictured above, holding a map of Paris). A lovely publicity still of Greta Garbo in one of her Adrian-designed costumes for Ninotchka (1939). The plot: Three Soviet appartchiks (Felix Bressart, Alexander Granach, Sig Ruman) arrive in Paris to sell jewels that were confiscated from the Grand Duchess Swana (Ina Claire) during the Russian Revolution. However, instead of unloading the gems and quickly heading back to Moscow, the trio begin sampling the culinary and cultural delights of the City of Lights. Eventually, the formidable bureaucrat Ninotchka Yakushova (Garbo) is sent to sort things out with Swana's suave emissary, Count Leon d'Algout (Douglas), who rather unsuccessfully tries to charm the humorless woman. The moment: Leon and Ninotchka meet for lunch where he tries to make her laugh by telling silly stories (clip below). The Backstory: Garbo was one of MGM's brightest stars throughout the 1930s, but audiences changing tastes -- the melodramas and costume pictures that were Garbo's bread-and-butter were no longer popular -- and Garbo's own boredom with Hollywood, meant that the studio badly needed to find a new way to present the Swedish star to the public. Enter director Ernst Lubitsch. His signature Lubitsch touch, a sophisticated style of film-making that combined witty comedy with scintillating romance, had already revived the flagging career of Marlene Dietrich, and studio chief Louis B. Mayer hoped he could work the same magic with Garbo. How the moment happened: Garbo had successfully played comedic roles in Sweden, but she was also an exceptionally reserved person; the famous "I want to be left alone" business wasn't merely the concoction of MGM's publicity department. In fact, the demands required by the script proved almost too much for her too handle, although Lubitsch did all he could to charm and cajole a performance out of Garbo. 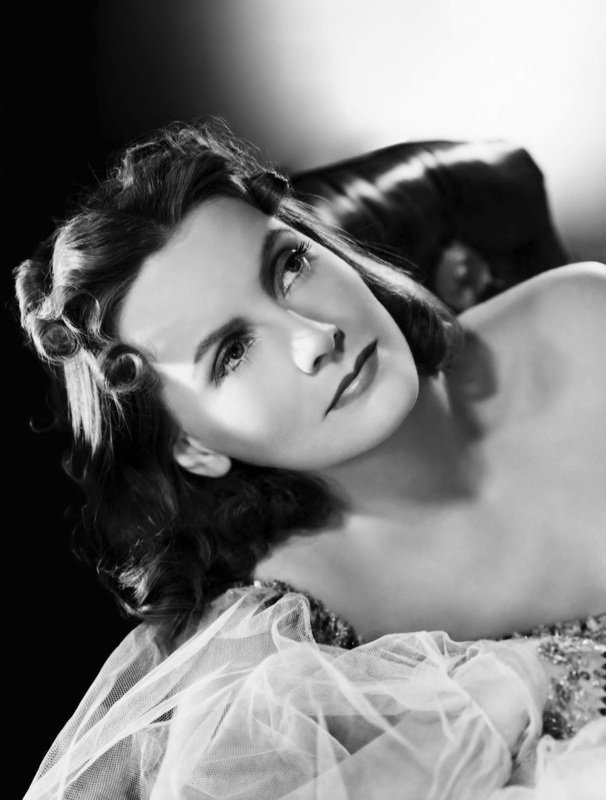 In an interview quoted in John Bainbridge's Garbo biography, Lubitsch remembered Garbo as possessing no acting techniques; instead she had to "feel" a scene to play it successfully. "She is probably the most inhibited person I ever worked with. When you finally break through the inhibitions and she really feels a scene, she's wonderful." Garbo liked to work on a closed set with only a few trusted associates. The laughing scene required the presence of several extras, which made the actress extremely anxious. She eventually came around and performed the scene beautifully, although she couldn't bring herself to laugh out loud during the scene so her guffaws were dubbed by another actor. Why the moment matters: In films like Anna Christie (1930) and Camille (1936) Garbo proved herself as one of the screen's great tragedians, but the laughing scene in Ninotchka shows there was more to the Divine Swede then endless suffering. Garbo's ace comic timing is in evidence throughout the scene, especially when she keeps slurping her soup and uttering a casual "nope" while Leon tells her silly stories. The aftermath: MGM's publicity department had a field day with the tagline "Garbo laughs" and the film was a substantial box-office and critical hit with many reviewers comparing Ninotchka's deadpan stare to Buster Keaton. Garbo earned her final best actress Academy Award nomination although she lost to Vivien Leigh in Gone With the Wind (1939). Garbo made one more film, the 1941 romantic comedy Two-Faced Woman (tagline: "Go Gay with Garbo") before retiring from films at age 36. How you can watch it: TCM is airing Ninotchka at 10 pm ET April 5, 2019. 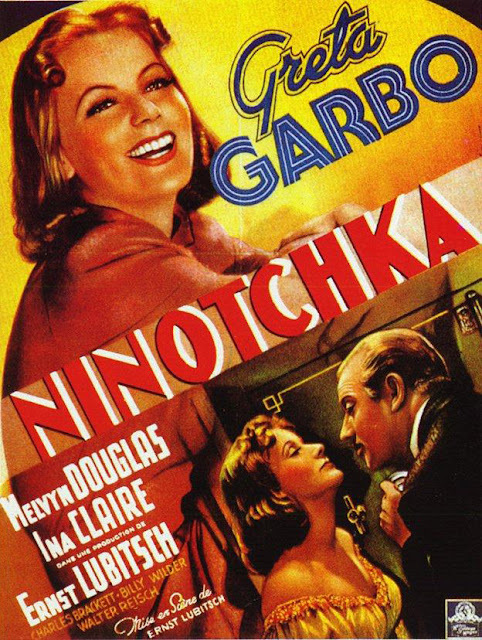 Warner Archive recently re-released Ninotchka on DVD and the film is available on video on demand. If you enjoyed Ninotchka, try: Composer Cole Porter's re-imagining of Ninotchka, Silk Stockings (1957). Starring Fred Astaire and Cyd Charisse, this is one of the last of the great old Hollywood musicals. For more of the lighter side of Garbo, try the pre-code drama Queen Christina (1933) in which Garbo does indeed laugh. Another great Douglas rom-com is the screwball Theodora Goes Wild in which he romances a dazzling Irene Dunne. Also, Marlene Dietrich and Douglas both sparkle in the Lubitsch-directed romance Angel (1937). Thanks for the fun and informative post! Congrats on 20,000 tumblr followers! Nice going! As for this film, you've made me want to drop everything and see it again. Garbo and Douglas are a terrific match, and the supporting cast is fabulous. I think a person could argue this is a perfect film – as perfect as films get, that is. I always go back and forth between this and The Shop Around the Corner as Lubitsch's most perfect film.